Quotes like this are an absolute goldmine for spiritualists and pseudoscientists who want utilise respectable fields of modern physics to support their ad-hoc theories of consciousness in the universe. To be fair, it is extremely easy to see why people tend to believe that quantum mechanics tells us that the world behaves differently when we’re looking at it, and that observation is at the heart of the mysteries of quantum mechanics. While I will be quick to point out that a theory of quantum mechanics based on consciousness has not been ruled out, it is certainly not the only way to formulate the laws “in a fully consistent way”. Pilot wave theory, GRW collapse theory, many-worlds theory, and decoherence theory are all consistent attempts at trying to make sense of quantum mechanics. Certainly in the modern arena of Philosophy of Physics, you will find far more academics subscribing to one of these theories than to a “consciousness” interpretation of quantum mechanics. If I tried to say something about all of these alternative theories, this post would soon become an essay, so I will devote a post individually to each of these theories at a later time. For now, I will explain how the obsession with observation came about in quantum theory, and why it’s misplaced. “It seems ludicrous to suggest that an electron can go through both slits at once, this is counter to all our intuitions about particles! The interference pattern is weird, but surely at least we should be able to say that the electrons only go through one slit or the other. Well, we can place detectors at the slits to observe which slit each electron actually goes through. Popular science books will phrase it like I have above – “it seems the electron knows when we’re observing it”. But really, it’s not surprising that the electron behaves differently when we observe it because observing a quantum system necessarily disturbs it. To observe which slit an electron goes through, we have to bounce a photon (light) off of the electron. This fundamentally changes the experimental set up. In our everyday lives, observation has very little effect on the things we observe. When you observe something, you bounce light off of it into your eyes, but the objects in our everyday lives are so massive compared to photons that shining light on an object doesn’t affect it. For an electron however, a suitably energetic photon can give the electron a real kick. It should not be surprising then that observing electrons changes the way they behave. There is absolutely no reason to make observation by a conscious observer fundamental at this point. There is a more well-known thought experiment however that poses more of a challenge to this conclusion. There’s a cat in a box accompanied by a radioactive source that has a certain probability of decaying in a particular time. If the source does undergo radioactive decay, then this registers on a detector which then smashes a vial of poison and kills the cat. Notice the strange thing here. When we observe the system by opening the box, the state of the system immediately seems to “collapse”. If we leave the system be then the state of the system is always (2), but as soon as we decide to open the box, the system is said to “undergo wavefunction collapse” and the state becomes either (3) or (4). This seriously seems to suggest that our observations – observations of a conscious observer – change the state of the world. To properly discuss this, it would be better to talk about it in the context of a more general problem; the central problem of quantum mechanics: the Measurement Problem. In everyday life everything we see is in a definite state. Cats are either dead or alive, objects are located either here or there. 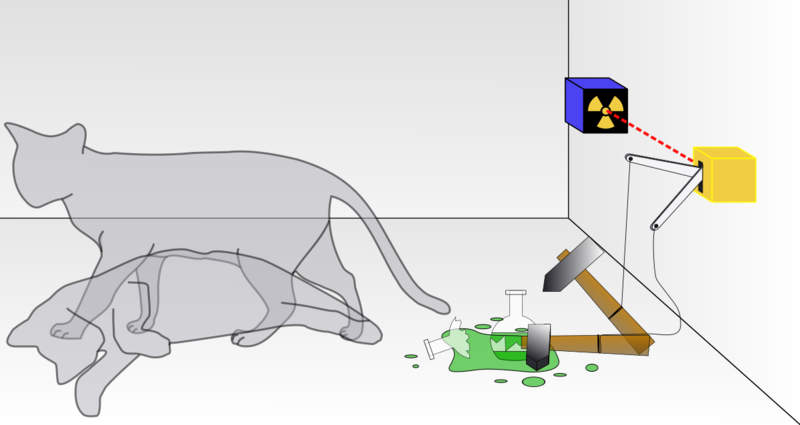 Quantum mechanics however predicts that any system that is in a definite state (such as |Dead Cat>) will immediately evolve into a superposition of some kind – a state like (2). As soon as we observe the system, this unitary evolution abruptly halts, and the system undergoes a wavefunction collapse into a definite state. And this is why observation seems so fundamental to quantum mechanics. We have these two inconsistent (as Wigner puts it) evolutions of systems: unitary and collapse, and collapse only occurs when we look at a system. Now we’ve seen where the misconception that conscious observation matters comes from, I will show why it’s a misconception. For starters, if you think that the universe evolves as a spooky quantum superposition until something conscious comes along to observe it and force it into a definite state, then you have some very tricky questions to answer. It’s virtually impossible to introduce consciousness as a solution to the measurement problem, without a decent theory of what consciousness is, and what creatures have it. If conscious observation were the only coherent candidate for a solution, then the problem I have just raised would become a research question, not an argument against a theory of quantum consciousness. GRW Collapse – The universe does evolve by the Schrodinger equation, but with a minor correction, a “collapse term”. This theory modifies the Schrodinger equation to combine collapse and unitary evolution into one law. The collapse term is designed such that very small systems virtually never undergo collapse (which is why they behave weirdly), whereas cats and humans and large systems undergo collapse almost instantly explaining why we always see things to be in definite “collapsed states”. Many-worlds Theory – Unitary evolution is the only evolution. Collapse is only an apparent law arising from the fact that we can only perceive one universe in the multiverse. Pilot-Wave Theory – Particles are real things, but are guided by probability waves. The probability wave evolves unitarily, whereas the particle is always in a definite state. Decoherence – Quantum behaviour is lost when quantum systems are exposed to their environments. If you were to conduct a survey of what academics in the Philosophy of Quantum Mechanics field supported from these options, you would find that all four of these options listed above received copious amounts of support, but very little support for consciousness as a solution to the measurement problem. To conclude, the measurement problem (which really is the central mystery of quantum mechanics) is often phrased in such a way that makes it seem like conscious observers play a fundamental role in the universe. While it may turn out that this is the case, consciousness receives far more attention than it deserves in the sphere of popular science. We have several, more precisely defined, proposed solutions to the measurement problem. So if you see a rather waffley, vague article on how consciousness may be the key to understanding quantum mechanics, take it with a pinch of salt. Certainly when we look at objects they behave differently to how quantum mechanics would predict, but it’s probably because conscious observers like humans are huge compared to quantum systems and disturb them, not because we happen to be conscious. Although I have been very disparaging about theories of quantum consciousness here, I find the other wacky idea mentioned on here “Many-Worlds Theory” much more worthy of attention. Whereas consciousness gets far more attention than it deserves in the popular sphere, “Many-Worlds Theory” is actually a major player in academic circles; it’s a very precise and well developed theory that has a very neat way of explaining the mysteries of quantum mechanics. I will have far more to say about Many-Worlds Theory in subsequent articles – the advantages it has over its rivals, but also it’s difficulties.